Donald Savoy Jr. sits with his cart during a Sunday market across from the Avenue Market in Baltimore, Md. on Sunday, June 4, 2006. 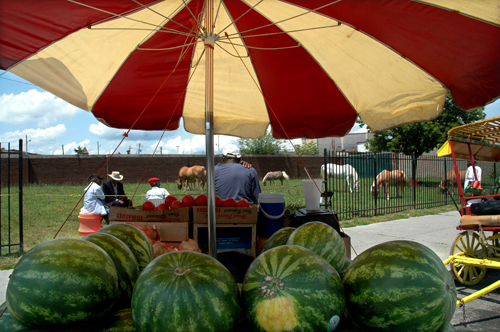 Savoy is a "Arabber", a Baltimore traditon of selling produce from a cart led by a donkey or horse. His father, a former Arabber, sits with friends in a field where children can pay for a horse or pony ride.